Blue@ print speaks.....: Maritzburg shock Pirates fans..
Maritzburg United pulled off a major upset on Wednesday night in beating Orlando Pirates 2-1 at Harry Gwala Stadium. 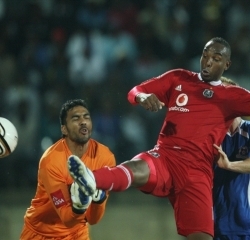 The opening goal was scored by the pirates striker Benni McCarthy in Shaib Walters polls through Mbuyane's corner. Orlando Pirates started to loose their game when Benni was senty off the pitch by the official red card due to the hitting of Maritzburg defender. Benni's goal didn't lead the the Buccaneers forever when Maritzburg striker Diyo Sibisi equalised in 49th minute and later in the game Mor Diouf scored a goal for his team to lead in the second half. 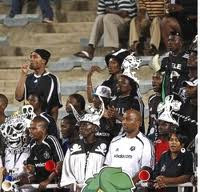 Buccaneers fans didn't expect what was coming to them when some fans started to leave Harry Gwala stadium last night. Substitute Bongani Ndulula almost equalize late on, but Maritzburg solid defender Petersen produced a timely defense to keep their goal post protected and secure the three points. Maritzburg United went home last night while the Happy people turned to be the "sad people" going home with nothing but tears..